This unique three pin timber arch bridge attracts the attention of those traveling down Rt. 565 towards the Hoyt Lakes Golf Course. It serves as both a vehicle bridge and a pedestrian bridge on the west side. A sign tells the history and facts of this popular landmark that was constructed over the Partridge River in 1996. 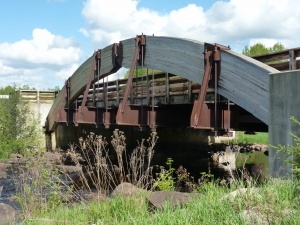 It is the first bridge of its kind in the state of Minnesota and is owned by the residents of St. Louis County.